Real estate activity across national boundaries (investment, development and asset management) is firmly established as a major component of global economic activity. International Real Estate provides the understanding of real estate strategies and transactions that cross national boundaries. International organizations lament the narrow perspective of professionals in the real estate field, which stems from training that takes a parochial rather than international view of the practices and processes of real estate markets. This book takes an explicitly international perspective to the decision-making process leading to final 'accept' or 'reject' investment decisions. It will be the first to adopt an institutional approach that directly addresses the problems of how to identify and avoid the main pitfalls of cross-border investment in real estate. The key to understanding international real estate comes from understanding the impact on investment and management decisions of differences in the formal and informal 'rules of the game'. The authors define the key feature of international real estate as the institutions that frame, facilitate or impede investment in land and buildings across national boundaries. 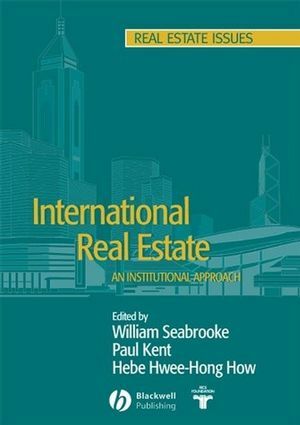 William Seabrooke is the editor of International Real Estate: An Institutional Approach, published by Wiley. Paul Kent is the editor of International Real Estate: An Institutional Approach, published by Wiley. Hebe Hwee-Hong How is the editor of International Real Estate: An Institutional Approach, published by Wiley.